breast cancer, cancer outcome, cancer prognosis, immune system. Summary. The immune system dramatically contributes to the pathogenesis of cancer. An integral estimation of immune system state is considered to be perspective as a prognostic criterion for cancer. We hypothesize that the integral characteristic, uniting numerous parameters of immune response to tumor and presenting the state of the immune system of a cancer patient, may be of prognostic significance. The aim of this work was to verify this hypothesis. Materials and Methods: We have evaluated 17 parameters cha­racterizing key innate and adaptive arms of immune system in 146 patients with primary diagnosed local breast cancer (BC) before cancer treatment. Using the original integrative approach of NovoSpark Corporation (Canada), we have presented the state of the immune system by a single visual image for each patient. Results: We classified all BC patients in two groups: with favorable and unfavorable immune system states according to our previous data demonstrating dramatic differences of the visual images of immune system states in patients with good or poor disease outcomes. Then, we have examined the relationship between integral characteristic of the immune system state and the clinical outcome. The 3-year disease-free survival (DFS) of BC patients with favorable immune system state was more than 96.0% vs 65.4% in patients with unfavorable status (p = 0.00006). Univariate Cox proportional hazards regression analysis showed that the integral characteristic of immune system state assessed prior to cancer treatment as unfavorable, was predictive of the poorer DFS (HR = 15.70 [2.15–114.90], p = 0.0007). Conclusion: The integral characteristic of the immune system state is a significant prognostic factor in BC patients. The BC patients with favorable integral immune system state can be considered as a target group for immunotherapeutic approach. Abbreviations used: BC — breast cancer; CAF — сyclophos­phamide — doxorubicin — 5-fluorouracyl; CD — cluster of differentiation; CIC — circulating immune complexes; DFS — disease-free survival; FAC — 5-fluorouracyl — doxorubicin — cyclophosphamide; HR — hazard ratio; Ig — immunoglobulin; IL — interleukin; PBMC — peripheral blood mononuclear cells; TNF — tumor necrosis factor. The prediction of cancer outcome in general and in breast cancer (BC) in particular gives an important clue to provide effective care for patients with malignant tumors. Favorable or unfavorable prognosis of the disease defines the choice of a cancer treatment protocol for every single patient. Therefore, the ade­quacy of treatment regimens, which means maximum therapeutic effect combined with maintaining the good quality of life and low cost, depends on the accuracy of the outcome prognosis [1–4]. Due to an impressive growth in the knowledge in the area of molecular and cellular pathogenesis of malignancies, a lot of molecular and cellular predictors have been implemented in the cancer patients’ care over the last decade. For example, the BC classification by Therese Sørlie and Charles M. Perou (2001) is based on molecular and genetic features of BC cells; it drastically improves the accuracy of the BC outcome prediction and offers the opportunity to personalize treatment . Nevertheless, some cancer patients are still devoid of correct forecasting [6–8], that results in either the early tumor progression or unreasonable toxic loads or substantial cost increases [3, 9–12]. Thus, further search for predictive criteria of cancer outcome is an urgent task. Progress in the discovery of the cancer molecular and cellular pathogenesis has provided plenty of evidence that the immune system plays a significant role in cancer initiation, promotion and progression [13–18]. Therefore, many immunological parameters were considered to be the perspective cancer outcome predictors [4, 13, 16, 17, 19–24] and now the prognostic value of some of them has been clinically proved [13, 21, 25]. Moreover, the accuracy of outcome prediction in colon cancer patients, based on immunological findings, has been shown to be higher than that based on classical clinical and pathologic parameters [26–29]. The majority of the proposed immunological criteria are related to the local immune response to tumor [13, 19, 20, 23, 24, 27–29]. But we should take into consideration that cancer is a systemic disease and it invades the entire body rather than only a local site [30–32]. It seems acceptable that the immune system as a system, maintaining the entirety of the body and working in a coordinated fashion against nume­rous threats from the external or internal environment, responds to a tumor as an entire unit as well [33, 34]. In this case, not only local, but systemic immunological parameters could be useful for integral characteristic of the immune response [27, 35–37]. The observation of the entire rhythm of the activity of many parameters of systemic immunity in cancer patients by Dronka et al. (2011, 2012) supports the existence of an integrative immune response to a tumor [35–37]. Our previous works also give certain evidence of integral response of immune system to tumor. We have demonstrated that to classify BC patients according to their disease outcomes with the least error, we should include seve­ral (about 18–22) immunological parameters in the classification model. If the number of the parameters is less, the error grows . In other words, the immune system provides the response to tumor by key patterns of immunological mechanisms . The next question is what approach should be applied to characterize such a complex and multidimensional system in the tumor bearing host . One of the ways is the systems biology approach, which is difficult for a routine practice due to the multipara­meter measurements need to do and data abundance for interpretation [40, 41]. Therefore, the desired approach should reflect multidimensionality of the immune system and provide available data interpretation. The multidimensional visualization integrative approach of the NovoSpark Corporation (Canada) meets these requirements. The core idea behind the NovoSpark’s visualization technique is to pre­sent each multidimensional observation as a single two-dimensional curve. The approach establishes a one-to-one accordance between data records and observation curves . In our previous study, we have applied the approach of NovoSpark multidimensional data visualization to generate an integral characteristic of the immune system state, uniting 52 separate immunological parameters, in 65 BC patients before treatment . When we analyzed features of a visual curve as an integral characteristic of the immune system for each BC patient, we found that its location in multidimensional data space depends on disease outcome followed for 3 years . The obtained data allow us to assume that a unified characteristic of the integral state of the immune system can have a predictive value for cancer outcome. The goal of this work is to verify this hypothesis. Patients. 146 patients diagnosed with primary local BC between October 2003 and December 2006 were enrolled in the investigation. The median age was 51 years (age range: 45–56). The patient pathological stages ranged from I to III. Patients with diagnosed metastatic BC (i.e. IV stage) were not enrolled. The main patient clinical and pathological characteristics are summarized in Table 1, part A. None of the patients had previously received any cancer treatment. During the course of cancer treatment, the patients underwent a curative surgery of primary tumor (radical mastectomy, radical and sectoral resection) and of regional lymph nodes. The cancer treatment obligatory included the appropriate courses of neoadjuvant chemotherapy, adjuvant chemo-, radio- and hormonal therapies according to the pathological stages and routine predictive criteria (Table 1). The standard chemotherapies regimens predominantly used in the study are FAC, CAF. Note: *differences are statistically significant in comparison with total group, p < 0.05; #differences are statistically significant in comparison with group without progression, p < 0.05. The patients were followed for disease progression until 3 years after the enrollment of the last patient (December 2009). We have estimated the disease-free survival (DFS) as the time between the enrollment and the date of the first detection of the tumor progression. There were four types of BC recurrences that we regarded as a progression: 1) hematogenous metastases, 2) local relapse, 3) simultaneous meta­stasis and local relapse, 4) as well as the second tumor manifestation in the other breast. All the patients gave written informed consent to participate in this investigation. The study was approved by Ethics Committee of Tomsk Cancer Research Institute and performed according to the guidelines of Declaration of Helsinki. Methods. To characterize the immune system state as an integral unit, we estimated separate parameters of the innate and adaptive arms of immune system in the BC patients and then we integrated the obtained values into a single characteristic as a visual image using NovoSpark Visualization approach. The previous research has shown that only 17 of 52 immunological parameters were significant for the association with BC outcomes, and we have selected the following ones: percentage of CD4+, CD8+, CD56+, CD22+ and CD95+ peripheral blood mononuclear cells (PBMC); spontaneous and mitogen stimulated secretion of interleukin-1β (IL-1β) and tumor necrosis factor-α (TNF-α) by PBMC; neutrophil functional activity; immunoglobulins (Ig) of A, M, G classes and circulating immune complexes (CIC) in blood serum . In order to test the immune system state, venous blood was obtained from the patients before cancer treatment. Cell preparation for immunochemical staining or culturing in vitro. The PBMC were isolated by the density gradient centrifugation from peripheral blood that was collected into BD Vacutainer Plus Cell Preparation Tubes (BD Diagnostics, USA) according to the manufacturer’s instructions. Some cells were then resuspended (2•106 cells/ml) in phosphate buffered saline for immunochemical staining; other cells were resuspended (5•106 cells/ml) in RPMI-1640 (Invitrogen, USA) with 5% heat-inactivated fetal cow serum (Invitrogen, USA) for seeding in 96-well U-bottom plates for further estimation of their cytokine secretion level. The second procedure was performed in sterile conditions. Immunocytochemical staining of peripheral blood lymphocytes. In order to quantify PBMC subpopulations, we have applied the immunocytochemical method described in . Briefly, the fresh isolated PBMC were placed on a glass slide and then co-incubated with primary specific antibodies for 40 min at the room temperature. The primary mouse monoclonal anti-human antibodies were used against molecules CD4 (Edu-2), CD8 (UCH-T74), CD22 (RFB4) and FAS/CD95 (LOB3-17) that were produced by NovoCastra (UK) and CD56 (MOC-1) produced by DAKO (Denmark). Then the slides were dried by a filter paper, and the cells underwent a reaction with compounds of Visulisation Polymer-HRP detection system EnVision (DAKO, Denmark). This stage lasted for 30 min. The nuclei of cells were additionally stained by hematoxylin. The immunocytochemical analysis was performed by the light microscope Axiostar Plus, Carl Zeiss. The results of the analysis were presented as the percentage of positively stained cells in the sample (500 cells in all fields of view). Estimation of cytokine level in supernatant medium of PBMC in vitro. The fresh isolated PBMS were placed into 96-well U-bottom plates at 250•103 cells/well and incubated at 37 °C with 5% CO2 for 24 h in the full culture medium RPMI-1640 described above. The basic cytokine production was measured without suplemented stimulators. To stimulate TNF-α and IL-1β production, we added phytohemagglutinin (25 µg/ml, Sigma, USA) and lipopolysaccharides (10 µg/ml, Sigma, USA), respectively. The obtained supernatants were harvested and stored at –80 °C until detection by ELIZA-assay kits (Cytokine Ltd, Russia) according to manufacturer’s instructions. NBT-test for neutrophils functional activity estimation. The functional activity of neutrophils was detected by the nitro blue tetrazolium reduction test (NBT-test) by Nesterova et al. . We mixed 50 µl of fresh blood with 25 µl of 0.2% NBT solution and 25 µl of PBS in glass tubes to estimate the basic activity of the neutrophils. By substituting phosphate buffered saline for the opsonized zymosan solution we were able to estimate the stimulated neutrophil activity. After the incubation for 30 min at 37 °C we smeared a drop of the reactive mixture on the surface of a glass slide. To visualize the reaction, we used a light microscope Axiostar Plus (Carl Zeiss, Germany). The results of the reaction were expressed in two ways: as a percentage of positively stained neutrophils out of all 500 neutrophils and as an integral parameter of staining intensity of each neutrophil. The last para­meter was calculated on a scale of 1 to 4, with 1 point for a neutrophil with less than a quarter of cell area stained with formazan — a product of NBT reduction; 2 points — from a quarter to a half of cell area; 3 points — from a half to three quarters of cell area and 4 points — more than three quarters of cells area. Estimation of serum soluble factors. Ig A, M, G, and CIC were estimated in serum of patients. The sera were isolated by centrifugation from the blood collected into BD Vacutainer Plus Cell Preparation Tubes (BD Dia­gnostics, USA) according to the manufacturer’s instructions. We stored all the sera at –25 °C until the analysis by ELISA-assay and then estimated Igs and CICs in the samples by using the corresponding kits produced by Vector-BEST (Russia). Multidimensional Data Visualization Method. In our study, we used a data visualization integrative approach of the NovoSpark Corporation (Canada) . To generate the single characteristic of the immune system state in each BC patient we entered the 17 separate immune parameters in the table of the NovoSpark Visualizer software and then we got individual curve, having own shape and location in multidimensional data space. Statistical analysis. Statistical analysis was performed using Statistica version 6.1 (StatSoft Inc). Differences between groups were evaluated using the chi-square test for categorial variables and the non-parametric Mann — Whitney U-test for continuous variables. DFS was estimated by using the Kaplan — Meyer method, and differences between groups with favorable and unfavorable immune system states were tested with log-rank test. Hazard ratios (HR) were determinated using the Cox proportional hazard model. Differences were considered significant when p < 0.05. Characteristics of BC patients with different outcomes. The median time of the follow-up was 34.8 months (interquartile range 26.3–42.3) with the maximum of 81.5 months. The 3-year DFS and the median of DFS of the BC patients enrolled in the study was 73.0% and 61.1 months, respectively (Fig. 1). At the last follow-up, 104 out of 146 patients (71.2%) had no signs of cancer progression while 42 women (28.8%) demonstrated one of the recurrence types. In particular, 32 women (21.9%) had hematogenous metastases, 6 women (4.1%) — local relapse, 2 wo­men (1.4%) and 2 women (1.4%) — simultaneous local relapse and metastasis, and a tumor in the other breast respectively (Table 2). The BC patients without progression during follow-up period had not marked clinical and pathological differences with total BC patients’ group enrolled in the study (Table 1, columns A and B). The women, who have displayed BC progression within follow-up period, showed high frequencies of lymph nodes involvement (grade N2) and lower incidences of N0 as a sign of higher grade of malignancy compared with total patients’ group (p < 0.05, Table 1, columns A and B). In general, marked differences were associated with clinical and pathological features of BC patients with hematogenous metastases (Table 1, columns A and C). The younger age was a specific characteristic in women with the simultaneous local relapse and hematogenous metastases (p < 0.05, Table 1, columns A and C). The comparative analysis of the patients, who survived during follow-up period without progression, and the patients with recurrences showed some diffe­rences in clinical features: high frequencies of lymph node metastasis N2, prevalence of tumor stage III and inflammatory clinical type were observed more often in the group with the progression (p < 0.05, Table 1, column B). Although the BC patients with different disease outcomes had clinical and pathological differences, only IL-1β secretion by PBMC was distinguished in the women with and without tumor progression. Higher level of IL-1β secretion was observed in relapse-free BC patients (Table 3). Note: *differences are statistically significant in comparison with group without progression, p < 0.05; #differences are statistically significant in comparison with group favorable immune system state, p < 0.05. Characteristics of BC patients with favorable and unfavorable immune state. Presenting an immune system state in an integral visual image of Novo­Spark Visualizer software for all 146 BC patients, we identified two groups of patients: with favorable (associated with DFS) or unfavorable (associated with recurrences) immune system state. The separated two groups were not identical to the groups of BC patients with and without progression in follow-up period (Table 1, column D). Clinical and pathological characteristics in BC patients with unfavorable immune system states did not differ from ones in total group, however women with favorable immune system states showed lower proportion of tumor stage III than in common group (p < 0.1, Table 1, columns A and D). We found no significant differences of clinical and pathological characteristics in BC patients with favorable and unfavorable immune system states (Table 1, column D). Cancer treatment regimens were similar in both groups (Table 1, column D). The BC patients with favorable and unfavorable immune system states had no significant diffe­rences among separate immunological parameters, estimated in the study, except of the inflammatory cytokines Il-1β and TNF-α secretion by PBMC (Table 3, column D). The PBMC in BC patients with favorable immune system states produced higher level of these cytokines in greater quantities than in women with unfavorable states. 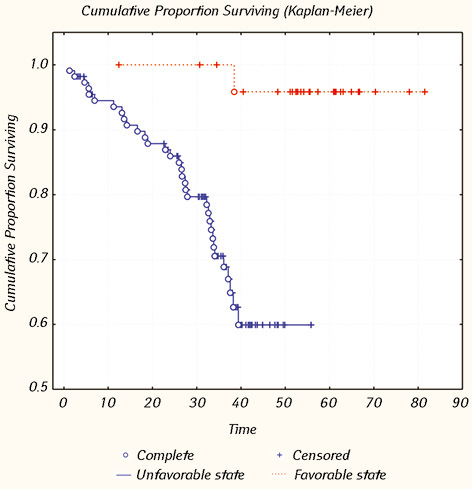 Survival of BC patients with favorable and unfavorable immune system states. Despite the absence of the substantial clinical and pathological differences, except of IL-β and TNF-α cytokines, produced by PBMC, and similar cancer treatment regimen in compared groups, the 3-years DFS in BC patients with favorable immune system states was more 96.0%, while in women with unfavorable immune system states it reached only 65.4% (p = 0.00006, Fig. 2). Integral immune system state is a prognostic factor for BC DFS. To clarify whether integral cha­racteristic of the immune system state as favorable or unfavorable was associated with clinical outcome in BC patients, univariate Cox proportional hazards regression analysis was performed. We have found the predictive value of integral immune system state. The unfavorable state of immune system detected prior cancer treatment predicts of worse DFS (HR = 15.70 [2.15–114.90], p = 0.0007). This fact confirms our hypothesis that the integral characte­ristic of the immune system state in BC patients has predictive value. The immune system is a complex net of thousands of different components acting on different targets and regulated by various negative and positive feedback loops . Despite its multielement structure, immune system is able to respond to any perturbation in coordinated fashion  as an integral unit. We suggest that similar integral fashion is implemented by immune system against tumors. In our previous study, using the integrative approach of multidimensional visualization (NovoSpark Corporation) to portray immune system state as a single visual image , we found that the immune system can be reside in at least two different states. One status, which we called as favorable, was observed in BC patients without recurrence, and another status — unfavorable — was associated with relapses in BC patients within 3 year follow-up period . Existence of different states of an immune system in cancer patients is in concordance with the concept of cancer immunoediting, which postulated immune system ability to protect cancer or, in contrast, to promote tumor growth and progression . Dronka et al. (2012) identified similar opposite states of the immune system in patients with metastatic melanoma [35–37]. But they observed change of the immune upregulation (activation) and downregulation (tolerance) during 3–4 days period, while we consider that anti-tumor and pro-tumor states of the immune system can be more stable and longer to determinate clinical features of cancer and disease outcome in each person. In the current study, we classified 146 ВC patients by estimating their integral immune system state with using the multidimensional data visualization approach. As a result, we have discerned two groups: with favorable or unfavorable states of immune system (Table 1, column D). These groups are not similar to groups divided using classification of cancer outcomes (Table 1, columns B and D), they are not distinguished from the total group either clinically or by pathological features, except less number of persons with stage III among the patients with favorable state of the immune system (Table 1). It is significant that the BC patients with favorable or unfavorable integral status of immune system were not different between each other, including single immunological parameters, except IL-1β and TNF-α cytokines produced by PBMC in vitro (Tables 1, 3). However, the difference in the DFS proved real existence of different BC clinical groups: a group with a favorable immune system state had better DFS compared to a group with an unfavorable state (p < 0.00006, Fig. 2). Therefore, an integral characteristic of immune system in BC patients identifies special clinical group with favorable prognosis, which can not be detected by clinical, pathological or separate immunological parameters. The answer to a question, why an integral characteristic of the immune system identifies differences among BC patients according their disease outcomes, whereas single immunological parameters can not do it, is related to key characteristics of “systems thinking” by F. Capra (1997). “The system thinking” supports the view that the functioning whole is more effective than the sum of its parts, especially relationships. In other words, due to multimodal regulatory relationships the whole becomes more functionally effective, than its parts . From this point of view, the increased secretion of cytokines IL-1β and TNF-α by PBMC could be considered not as a factor of inflammation, involved negatively in BC pathogenesis, but as some potential multimodal mediator for relationship of different elements of the immune system into integral unit. Cox’s regression analysis showed that the integral characteristic of the immune system state is a consi­derable prognostic factor in BC patients. The risk of progression in BC patients with unfavorable state of the immune system is 18 times higher than in patients with a favorable condition. Probably the BC patients with favorable integral immune system state constitute a target group for immunotherapeutic approach, because they have the immune system that is able to carry through its protective activity against tumor. This study was supported by the Russian Foundation for Basic Research (17-29-06037). Colleoni M, Viale G, Goldhirsch A. Lessons on responsiveness to adjuvant systemic therapies learned from the neoadjuvant setting. Breast 2009; 18: S137–S40. Goldhirsch A, Winer EP, Coates AS, et al. Personalizing the treatment of women with early breast cancer: highlights of the St Gallen International Expert Consensus on the Primary Therapy of Early Breast Cancer 2013. Ann Oncol 2013; 24: 2206–23. Campbell HE, Epstein D, Bloomfield D, et al. The cost-effectiveness of adjuvant chemotherapy for early breast cancer: A comparison of no chemotherapy and first, second, and third generation regimens for patients with differing prognoses. Eur J Cancer 2011; 47: 2517–30. Mei ZB, Shi L, Wang B, et al. Prognostic role of pretreatment blood neutrophil-to-lymphocyte ratio in advanced cancer survivors: A systematic review and meta-analysis of 66 cohort studies. Cancer Treatment Rev 2017; 58: 1–13. Oakman C, Bessi S, Zafarana E, et al. Recent advances in systemic therapy. New diagnostics and biological predictors of outcome in early breast cancer. Breast Cancer Res 2009; 11: 205. Rodenhiser DI, Andrews JD, Vandenberg TA, et al. Gene signatures of breast cancer progression and metastasis. Breast Cancer Res 2011; 13: 201. Saraiva DP, Cabral MG, Jacinto A, et al. How many diseases is triple negative breast cancer: the protagonism of the immune microenvironment. Esmo Open 2017; 2: e000208. Imai H, Kuroi K, Ohsumi S, et al. Economic evaluation of the prevention and treatment of breast cancer-present status and open issues. Breast Cancer 2007; 14: 81–7. Gramatyka M. Cardiotoxicity as undesired side effect in the treatment of breast cancer. Postepy Higieny I Medycyny Doswiadczalnej 2014; 68: 483–97 (in Polish). Chen XG, Li JJ, Ren J, et al. Selective impairment of attention networks in breast cancer patients receiving chemotherapy treatment. Psycho-Oncology 2014; 23: 1165–71. Hansen RN, Ramsey SD, Lalla D, et al. Identification and cost of adverse events in metastatic breast cancer in taxane and capecitabine based regimens. Springerplus 2014; 3: 259. Zitvogel L, Kepp O, Aymeric L, et al. Integration of host-related signatures with cancer cell-derived predictors for the optimal management of anticancer chemotherapy. Cancer Res 2010; 70: 9538–43. Cavallo F, De Giovanni C, Nanni P, et al. 2011: the immune hallmarks of cancer. Cancer Immunol Immunother 2011; 60: 319-26. Bachireddy P, Rakhra K, Felsher DW. Immunology in the clinic review series; focus on cancer: multiple roles for the immune system in oncogene addiction. Clin Exp Immunol 2012; 167: 188–94. Lippitz BE. Cytokine patterns in patients with cancer: a systematic review. Lancet Oncol 2013; 14: E218–28. Whiteside TL. Immune responses to cancer: are they potential biomarkers of prognosis? Front Oncol 2013; 3: 1–8. Whiteside TL, Demaria S, Rodriguez-Ruiz ME, et al. Emerging opportunities and challenges in cancer immunotherapy. Clin Cancer Res 2016; 22: 1845–55. Al-Shibli K, Al-Saad S, Andersen S, et al. The prognostic value of intraepithelial and stromal CD3-, CD117- and CD138-positive cells in non-small cell lung carcinoma. APMIS 2010; 118: 371–82. Suzuki K, Kachala SS, Kadota K, et al. Prognostic immune markers in non-small cell lung cancer. Clin Cancer Res 2011; 17: 5247–56. Faria SS, Fernandes PC, Silva MJB, et al. The neutrophil-to-lymphocyte ratio: a narrative review. Ecancer 2016; 10: 702. Matsueda S, Komatsu N, Kusumoto K, et al. Humoral immune responses to CTL epitope peptides from tumor-associated antigens are widely detectable in humans: A new biomarker for overall survival of patients with malignant diseases. DCI 2013; 41: 68–76. Shang B, Liu Y, Jiang SJ. Prognostic value of tumor-infiltrating FoxP3(+) regulatory T cells in cancers: a systematic review and meta-analysis. Sci Rep 2015; 5: 15179. Shou JF, Zhang ZG, Lai YC, et al. Worse outcome in breast cancer with higher tumor-infiltrating FOXP3+ Tregs: a systematic review and meta-analysis. BMC Cancer 2016; 16: 687. Park IH, Kong SY, Ro JY, et al. Prognostic implications of tumor-infiltrating lymphocytes in association with programmed death ligand 1 expression in early-stage breast cancer. Clin Breast Cancer 2016; 16: 51–8. Mlecnik B, Bindea G, Pages F, et al. Tumor immunosurveillance in human cancers. Cancer Metastas Rev 2011; 30: 5–12. Ascierto ML, De Giorgi V, Liu QZ, et al. An immunologic portrait of cancer. J Transl Med 2011; 9: 146. Galon J, Pages F, Marincola FM, et al. The immune score as a new possible approach for the classification of cancer. J Transl Med 2012; 10: 1. Galon J, Angell HK, Bedognetti D, et al. The continuum of cancer immunosurveillance: prognostic, predictive, and mechanistic signatures. Immunity 2013; 39: 11–26. Demicheli R, Retsky MW, Hrushesky WJM, et al. 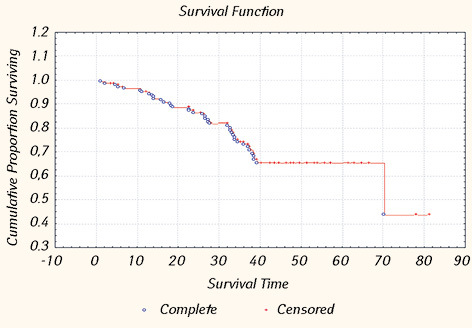 The effects of surgery on tumor growth: a century of investigations. Ann Oncol 2008; 19: 1821–8. Hanin L. Why victory in the war on cancer remains elusive: biomedical hypotheses and mathematical models. Cancers (Basel) 2011; 3: 340–67. Meng XL, Zhong J, Liu SY, et al. A new hypo­thesis for the cancer mechanism. Cancer Metastas Rev 2012; 31: 247–68. Nicholson LB. The immune system. Essays Biochem 2016; 60: 275–301. Marques RE, Marques PE, Guabiraba R, et al. Exploring the homeostatic and sensory roles of the immune system. Front Immunol 2016; 7: 125. Holtan SG, Dronca RS, Nevala WK, et al. The dynamic human immune response to cancer: it might just be rocket science. Immunotherapy 2011; 3: 1021–4. Dronca RS, Leontovich AA, Nevala WK, et al. Personalized therapy for metastatic melanoma: could timing be everything? Future Oncol 2012; 8: 1401–6. Leontovich A, Dronca R, Suman V, et al. Fluctuation of systemic immunity in melanoma and implications for timingof therapy. Front Biosci (Elite Ed) 2012; 1: 958–75. Stakheyeva MN, Serykh AP, Karas SI, et al. The complex of informative immunological parameters for breast cancer outcome prognosis. Bull Sib Med 2015; 14: 30–4. Fox BA, Schendel DJ, Butterfield LH, et al. Defining the critical hurdles in cancer immunotherapy. J Transl Med 2011; 9: 13. Tsang JS, Schwartzberg PL, Kotliarov Y, et al. Global analyses of human immune variation reveal baseline predictors of postvaccination responses. Cell 2014; 157: 499–513. Brodin P, Jojic V, Gao TX, et al. Variation in the human immune system is largely driven by non-heritable influences. Cell 2015; 160: 37–47. Eldenzon D, Shamroni D, Volovodenko V. Method and system for multidimensional data visualization. Saarbrucken: LAP LAMBERT Acad Publ, 2013. 45 p.
Stakheyeva M, Eidenzon D, Cherdyntseva N, et al. Multidimensional visualization for the immune system state presentation in breast cancer patients. 5th Int Sci Conf on New Operational Technologies (NEWOT); 2015 Sep 29–30; Tomsk, Russia 2015. Stakheyeva M, Eidenzon D, Cherdyntseva N, et al. Inventors method for predicting hematogenous metastasis in patients with breast cancer during antitumor treatment. Patent of Russian Federation, 2011 (in Russian). Totolian AA, Baldueva IA, Bubnova LN, et al. Standartization of immunophenotyping methods of human blood and bone marrow cells. Part III. Immunochemistry method. Part IV. Normal values. Clin Lab Diagnost 2002; (1): 44–50. Nesterova IV, Kolesnikova NV, Simbirtsev AS, et al. Influence of long-time administration of syntetic dipeptide on neutrophile function in vivo. Immunologia 1999; (6): 40–6. Swann JB, Smyth MJ. Immune surveillance of tumors. J Clin Inv 2007; 117: 1137–46. Capra F. The systems view of life a unifying conception of mind, matter, and life. Cosmos and History. J Nat Social Philosophy 2015; 11: 242–9.